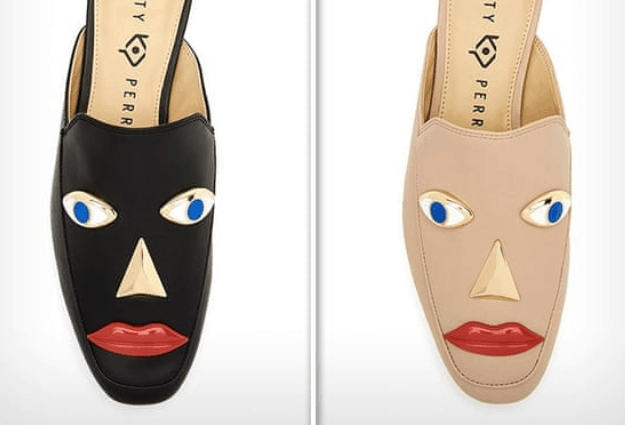 Katy Perry’s fashion line has pulled a line of footwear from stores after they were accused of using a design which resembled blackface. The Katy Perry Collections Rue sandals and Ora loafers feature prominent red lips on black fabric and have garnered comparisons to the Sambo caricatures which have long been regarded as racist caricatures. Speaking to TMZ, a spokesperson for the fashion line said: “In order to be respectful and sensitive the team is in the process of pulling the shoes”. The shoes, which were previously stocked in most US retailers including Walmart, have now been removed. Perry’s designs are the latest in a series of garments to come under fire for using supposed blackface designs. Gucci, Prada, and Moncler have all received backlash for using the red-lipped Sambo design. In 2016, Moncler released a winter-sports line which featured a black-faced motif with red lips. The design, which the brand claimed to be a cartoon penguin, bore similarities to the now-banned controversial caricature dolls. In December, Prada removed a series of accessories which appeared to be designed in the image of black monkeys with red lips. Just last week, a black turtleneck jumper which featured red lips and presented on a model in a balaclava style was removed from Gucci shops. Photo by Katy Perry Collection.